How To Get A Stable Temp Reading From A10-5800K? I built an FM2 system (GA-F2A85XM-D3H, A10-5800k) for a friend and the temp readings in the BIOS are all over the map. Starts out around 40-42C then jumps to 73C drops to 60C drops to 48C and then back up to 60C. It doesn't really settle. Googling shows others seeing the same behavior. Checking temps in windows is much the same because apps get their info from the BIOS. Is there any way to get a stable temp reading? The best I have seen is to use the GPU reading. At least that reading is stable. In Windows use AMD Overdrive and Coretemp for somewhat accurate readings. Temp readings are borked in Trinity and Richland APUs. Just gotta live with it. Edit: Maybe just Trinity APUs? Replacing it with an Intel would also do the trick. so, what you are saying is that I should replace the AMD cpu with an Intel one (which one?) in my AMD motherboard? seriously, why are you trolling my thread? IIRC, I was never able to get reliable temp readings from any AMD cpu. Because AMD CPU's are known for giving unreliable temperature readings. Sorry, you can't, as AMD doesn't publish their temperature sensor data. It's all just a guess, that's why you have people thinking their CPUs run at lower than ambient temperature. I had reliable temps from my Athlon II x3 455 and from my old PII x4 965. This is the first cpu I have had that doesn't have reliable temps and it confused me. According to HWMonitor, my FX-6200 idles 5-10 degrees below room temperature. I'm not a scientist, but I'm fairly certain incorrect. It's probably reading thermal margin. OP, I use a combination of Coretemp (there's even a new version out) and Speedfan to read temps on my Kaveri. That combination should work for you on Trinity. Err, no. Kaveri has working temp readings. The thermal sensors on Trinity are just plain borked. The laptop in sig I just got about a month ago and investigated this recently. When it comes to trinity, it appears the thermal margin is defined in BIOS (hidden, not changeable) and the sensors work from there. HWinfo -> sensors window found the most accurate readings. 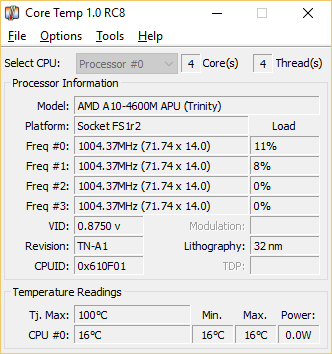 AMD overdrive calculates temperate away from thermal margin, which on my laptop is 70C. Coretemp/GPUz do NOT work on these chips. HW info, but compare with AMD overdrive to find your TM. it idles around 42C in HWinfo. Kaveri has better temp sensors than Trinity? That's actually kind of sad, since the sensors on Kaveri are pretty messy. I'm surprised CoreTemp can't get at the thermal margin, but then I don't have hands-on experience with Trinity/Richland APUs. Temps look pretty good there. Does it seem to fluctuate appropriately with CPU load? Coretemp is useless with APUs, but fantastic for desktop AM3+. It thought both my a8-4500m and a10-4600m were 16C no matter what. Completely broken. Coretemp works on my A10-7700k, at least for showing thermal margin. You're using a bugged version of CoreTemp, try the latest one. I encountered that bug, reported it on the XS thread, and now there is a fixed version available. SMH. Guys, for the last time, AMD hasn't published their temperature sensor data. Without it you can't measure the temperature. AMD sets the Tctl_max for all their lidded CPUs to 70. Tctl is not the actual temperature of the CPU, and it is all adjusted on a per CPU (model?) basis, thus Tctl=70 on a 8350 would have a temperature of X while Tctl=70 on a 1M/2T CPU would have a different actual temperature of Y. The Thermal Margin is the distance of the current Tctl from Tctl_max. Bigger values for the thermal margin mean a cooler temp, smaller values a hotter one. Once Tctl=Tctl_max=70, the CPU/mobo must take action to bring down the temperatures, such as throttling. You are unable to get actual AMD CPU temperatures with their built-in sensors, but it's not too important. While it's not technically correct to think of Tctl_max as 70c and Tctl as the current temperature in degrees Celsius, in practice they can be thought of as such as long as you aren't making direct comparisons between Intel/AMD and even between AMD CPU lines. Just keep your values below 70 (or keep your thermal margins > 0).